The French carrier Air Austral, which is based on Reunion Island in the Indian Ocean, has awarded CHEP Aerospace Solutions a five year ULD management contract. The airline recently took delivery of its first Boeing 787-8 Dreamliner, making it the first French carrier to operate this aircraft. It also has three Boeing 777 aircraft in its fleet. The choice to use CHEP to manage its ULD contingent was made because of what they see as CHEP’s unique pooling model to drive efficiency and reduce costs. “a garden of innovations“ at this year’s international trade fair ‘transport logistics China’ which starts this week in Shanghai. In a pre-release, Jettainer states that innovations to be introduced are related to the ULD device itself as well as an enhancement of the company’s IT landscape connected with the software and accessibility on mobile devices. 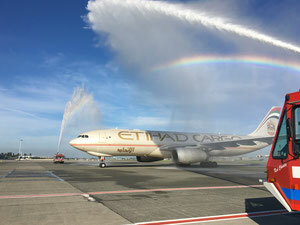 Etihad Crystal Cargo, the cargo arm of the Arabian carrier has touched down at Brussels Airport with an all-cargo Airbus A330F. The BRU-AUH sector will be served twice a week. The company has been a customer of the airport since 2006, at first starting with the route Abu Dhabi-Brussels-Toronto. Later the airline decided to serve Toronto directly from its home base. Today the passenger service offers eicht direct flights a week between Brus-sels and the capital of the United Arab Emirates. The Algerian national carrier ordered two Boeing 737-700 converted freighters from Boeing and has now received the first one. The -700C program was launched way back in 1997, but since then only three commercial (excluding military variants) aircraft have been delivered. Mostly to niche operators in the oil and gas industry. Saudia Arabia’s ARAMCO company took two of these in 2001 and an Angolan oil & gas operator called Sonair, took one aircraft. This one has in the meantime been reconverted for passenger work and is used by TAAG Angola. Air Algérie aims to utilize both their B737-700s exclusively for scheduled freighter services in the North African and Middle East regions for a new stand-alone cargo unit. The Shenzhen-based SF Express which also owns SF Airlines has made it known that they are revising their previously published plans for an IPO. The aim now is to do a reverse takeover of another existing firm, which is listed and not pursue their original IPO target. America’s Wall Street journal has reported that the Chinese logistics giant is having plans to effect merger with Maanshan Dingtai Rare Earth & new Materials Co. This is seen as being a complex deal that involves so-called asset swaps and a new share insurance. The new company will, it is reported, have a share value of around US$6.61 billion. The action has apparently been filed with the Shenzhen stock bourse. SF Express rival, YTO express also went down this road by planning to take over the Chinese automative company, Zheijiang IDC fluid Control for an amount said to be US$2.44 billion. Salam Aviation which is a UAE/US based aviation asset consultancy company, took delivery of an ex Tarco Air Boeing 737-400F. PEMCO World Air Services converted the aircraft from its original passenger configuration. It has so far not been revealed as to who will be operating the freighter, but PEMCO has stated that it will be in the air in normal cargo operations in the next weeks. The Omani national carrier has decided to select the British airport ground handling com-pany Menzies Aviation to help it set up its ground handling entity in Oman. A Memorandum of Understanding (MOU) was signed last week between both companies and after a prearranged due diligence period, both Oman Air and Menzies intend to complete the regulatory issues needed to get the deal moving. Introduction of the agreement is expected towards the end of this year and will encom-pass a total of nine Omani airports including Oman Air’s main hub at Muscat Airport. Trans Avia Export, a freight carrier based at Minsk Machulishci Airport has now added a Boeing 747-300 freighter to their fleet. A rarity in aviation circles. The B747-300 was originally delivered to the long defunct Belgian carrier, Sabena, back in 1990 and was the last of the few Boeing 747-300 series aircraft ever built. The aircraft was recently registered as $L-ACE with the Georgian carrier TCA - The Cargo Airlines who are based in Tbilisi. The B747-300F will join the fleet of the Belarus carrier’s two B747-200Fs.